You’ve determined that you are in need of a Phoenix roofing company, so it’s time to vet the options. How do you know what to look for in a roofer? The roof on your Arizona home is an important investment, and is an essential component to your home that you do not want to chance being done poorly or incorrectly. Discount roofing companies may offer steep discounts, but in the end, could become costlier because of the cheap materials and lack of experienced workers used to complete the project. When monsoon season comes around again, you want to make sure that your roof is going to hold down the fort, literally. Here is how to make sure that the guy crawling on your roof, hammer and nails in hand, is going to do that job the right way the first time, with quality and longevity in mind. In the age of technology, finding a roofer is no problem. However, it takes a little more of an in depth vetting process to narrow it down to a roofer that you want working on your home. Start out by asking friends and family for recommendations. Keep an eye out for advertisements, and head to the web to search out sites that offer customer feedback. Read the good and bad reviews, and be prepared to ask the companies questions in regards to both the bad and the good. You can check with the chamber of commerce to see if each company is a new member or if they are a long time member. Check to see if they have a rating with the Better Business Bureau. Ask the companies directly for professional references as well. It would be a bad sign if they didn’t have any professional references to offer up. Contractors are required to have permits and licenses specific to their state, county, and city. Ask the companies for proof of licensing, and check the validity with the city and/or county. The license can offer separation between the more and less experienced companies, and could help further narrow the field. Always make sure that the company you hire has the proper licensing for the roofing project you’re hiring them for. How Skilled Are the Employees? Whether you’re re-roofing or just getting a roof repair done, you want a company that takes care to hire the best, most experienced roofers. You don’t want someone with minimal or inadequate skills nailing holes into your roof. Ask the companies what they do to ensure that the roofers they’re sending to your home are the most skilled for the project. Inquire as to their safety training and practices, and how often they undergo refreshers on each. You may even ask to see what type of training the employees undergo, so you can see the level at which they are being trained. You may be able to compare training protocol for different companies, and see which ones put safety first. There are different types of guarantees to be had when hiring a roofer. Most companies will offer a guarantee on their product, but that does no good if it’s not accompanied by an installation guarantee as well. Having both means that even if the contractor makes a mistake during installation, you can be assured that they will make it right and fix their mistake. The Phoenix roofing company you hire should carry liability insurance, and it should cover both you and the workers if an accident occurs during the roofing project. 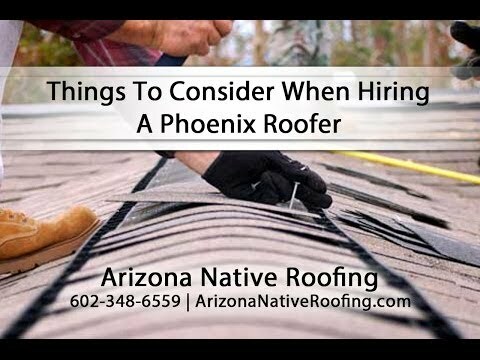 After you hire your Phoenix roofer, ask the company for proof of insurance, and make sure that it releases you from liability in the case of an accident, as well as having coverage dates that will cover the timeframe of the re-roofing project. If, for some reason, the coverage is insufficient or expires during the project, you may be liable for any accidents that result in an injured worker or even damage done to your roof in the process. Even though a disaster on the job is not something that is expected, there may be some concerns you have, or some mid-project repairs you find, and you want to have someone onsite to express these concerns to. Ask the companies you’re considering about what sort of over watch they have onsite and any given time as well as who your point of contact should be if you notice anything concerning during the project. The workers should also leave the site as clean as possible at the end of each day. More than likely, you’re still going to be living there, and your home needs to be both livable and well-kept during non-working hours. Ask the company what their policy is on keeping the site clean and orderly, and whom you would contact in the case that the site is not well-kept. A roofer can offer you everything under the sun, delivered on a silver platter. However, if you don’t get that in your contract, delivery is not guaranteed. Make sure to carefully read over every component of your contract before putting your signature on the line. Keep notes of each promise made by each contractor, and hold them to each promise. If the contractor us unwilling to follow through in writing, that’s not a good sign of follow-through. Some contracts can be wordy, lengthy, and unreadable to a layman. Ask for clarification on anything you don’t understand, and even consider having an attorney review it, so that you know that there aren’t any loopholes or hidden clauses built into the contract. Arizona Native Roofing is ready and qualified to complete your roofing project at the highest quality, with the highest quality materials. We pride ourselves on producing a product that you can be proud of, and that we are proud to put our stamp of guarantee on. Our roofers are highly experienced and skilled, and are ready to work for you. Please contact us at 602-348-6559 for an estimate on your roofing project. When Should I Replace My Phoenix Roof?